Fixing electric gate systems is our specialty, sure, but it's not our only specialty. 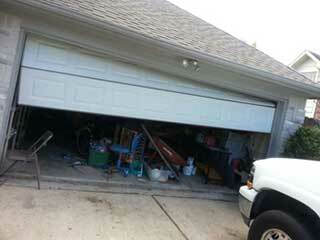 Our professionals are well versed and experienced in the art that is garage door repair. From replacing broken springs and cables to troubleshooting and solving electric or mechanical opener problems, there's no situation our experts can't handle. Why Did My Garage Door Spring Break? There could be several reasons for this, but the most common is simple – old age. The older these units get, the more they wear out, and the more you use your door, the quicker that happens. Because the springs are the ones that counterbalance the weight of the door panels, they're under a lot of tension on a regular basis, and therefore their structural integrity will slowly degrade over time. These units work using a lot of tension, so you must never attempt to repair or replace a broken spring by yourself, as you could get seriously hurt. A whole host of things could be the reason for this type of malfunction. From blocked or bent tracks to circuitry issues with your opener's logic board. Even the mechanical parts of your motor unit can create a problem, seeing as if one of them breaks or detaches, the opener won't be able to move the door. Leave it to our experts to run a diagnostics check to locate the source of the problem, and to then apply the appropriate solution. Your door will be back to its old self in no time. Unfortunately, your garage door can experience a whole lot more problems, ranging all the way from worn rollers to broken panels. Whatever the issue, though, you can always count on Gate Repair Thousand Oaks to be there to provide an effective and affordable solution. Give us a call today and let us know what you need our technicians to do for you.